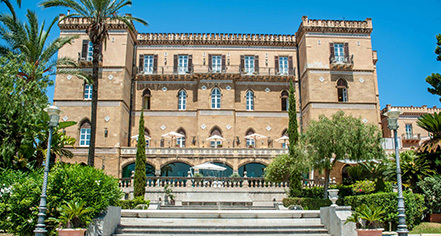 The picturesque Grand Hotel Villa Igiea Palermo - MGallery by Sofitel overlooks the crystal blue waters of the Porto dell’ Acquasanta, a spectacular marina in Sicily’s capital city of Palermo. This five-star luxury hotel was first built as a luxurious personal villa by English admiral Cecil Domville in the late-19th century. After being purchased by the Florio family in the early 1900s, the head of the family decided to reconfigure the property into a luxury hotel and named it for his daughter, Igiea. During this process, renovations to the villa were headed by Art Nouveau architect Ernesto Basile, while Italian painter Ettore De Maria Bergler created custom artworks for the hotel. The opulent accommodations at the Grand Hotel Villa Igiea feature 121 guestrooms with a combination of original furnishings and modern comforts, including plush beds, marble baths, and luxury toiletries. On property, guests have the choice of dining at two restaurants, as well as an indoor lounge and poolside bar and grill. The Beauty Corner & Fitness Center at the Grand Hotel Villa Igiea prides itself as the ideal relaxation spot for guests to find clarity, peace, and rejuvenation during their stay. This hotel also features ample meeting space for corporate functions and dream weddings in the capital of Italy’s idyllic Sicily. Grand Hotel Villa Igiea features an outdoor pool that overlooks the Bay of Palermo, tennis courts, sunset cruises, a library, and more for guests seeking to relax on the hotel grounds. Anyone who ventures off the hotel grounds can find a bevy of exciting activities, events, and trip-worthy destinations in the city of Palermo. For a day of exploring the city’s history, guests can easily walk to the UNESCO World Heritage Site area of the city from the hotel. The newly opened Villa Airoldi Golf Club is a worthwhile stop for a round of golf, just five minutes from the hotel. Guests to Palermo can visit the Teatro Massimo for opera or ballet, tour the Palermo Cathedral, or lounge on the scenic Mondello Beach. Spend a day at the local open-air market, Vucciria, to eat, drink, and shop for local delicacies. Guests to this Mediterranean escape will find that adventures are endless in Palermo. Grand Hotel Villa Igiea Palermo - MGallery by Sofitel, a member of Historic Hotels Worldwide since 2018, dates back to 1890s. This property features original artwork by Italian painter Ettore De Maria Bergler, an early and important adopter of the Art Nouveau style of painting. Extra Person Fees: Fees vary, dependent on room booked. Hotel/Resort Fees & Taxes: There is a city tax of $3.00 EUR per person, per night for up to 4 nights; this fee does not apply to guests under the age of 12. Pet Policy: Small pets are allowed; restrictions may apply. Rollaways: Rollaway beds are not available. Shuttle Service: Shuttle service to and from the airport is available April-October only. Contact property for more information. Transportation: Transportation, including an airport shuttle, may be arranged through the concierge; rates and restrictions may apply. 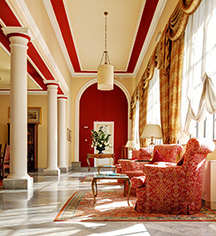 Learn more about the History of Grand Hotel Villa Igiea Palermo - MGallery by Sofitel .